In Seventh pAsuram – AzhwAr doubts if the togetherness with emperumAn will break and says “I cannot bear the separation” and requests emperumAn to keep him in emperumAn’s heart. Subsequently, AzhwAr says “How can I sustain myself without you who is so generous and most enjoyable?”. Seventh pAsuram – Contemplating the great favour which he got and the most enjoyable nature of the union with emperumAn, AzhwAr doubts that this cannot be sustained and says “if your highness leaves me, I will not even exist; please never leave me”. mun nal yAzh payil nUl narambin mudhir suvaiyE! kannalE! amudhE! kArmugilE en kaNNA! Oh one who is like the most enjoyable/matured music which is sourced from the nerve (String) and which is practiced in the musical instrument named yAzh and that follows the rules laid in the music literature! Oh one who exists as the supreme for the joy of those multitude of great persons! Oh one who can purify even those who don’t have such state of mind by eliminating their defects such as ignorance etc and giving them such joyful experience! Oh one who is having unlimited sweetness like sweet food item which has sweetness everywhere! Oh one who is the nectar which can give life to even dead ones! Oh the one who is having a magnanimous form like a cloud during rainy season (who is being the abode of such tastes)! 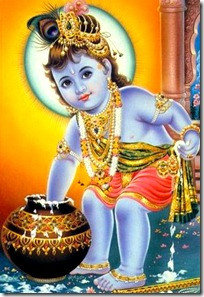 Oh one who assumed the form of krishNa to give blissful experience to me (with such divine form)! You (who has so much sweetness that will make others die if separated) keep me (who will die in separation) in your heart since I have no existence without you. munnal … – Some explain munnal by removing “n“, saying it as “munal” which indicates “mural” (making sound). Alternatively, munnal also is explained as unnal, which means contemplation – due to its sweetness, it makes one contemplate and blabber about it constantly. Otherwise, mun – oldness of the literature – due to the ancient nature of the literature, that too “nal” (good/distinct), yAzh payil nUl – the SAsthram which is studied about yAzh. nUl – SAsthram. So, as mentioned in SAsthram. narambin mudhir suvaiyE – sourced from the nerve, emperumAn who is most enjoyable like the matured music which came from the nerve (String) of the musical instrument. Here nerve (String of the instrument) is indicated instead of midaRu (throat) because, throat may have limitations due to infections etc due to ones own karma; but nerve always remains perfect. If there is unlimited joy like this, there should be some who enjoy that; they are explained further. pannalAr payilum paranE – As highlighted in nAchchiyAr thirumozhi 4.1 “theLLiyAr palar kai thozhum dhEvanAr” (Many intellectuals worship bhagavAn) – there are many of them, even if nithyasUris who are leaders in enjoying bhagavAn try to enjoy him, what is enjoyed will be less and what is to be enjoyed will be more. Even for those who have been eternally in this samsAram (material realm), he purifies them to bring them to the level of nithyasUris. pannalAr indicates mumukshus, even when they enjoy him forever, his sweetness does not reduce, and he who has the ability to eliminate the hurdles which stop them from enjoying him. kannalE – you who is unlimitedly enjoyable for me! amudhE – you who keeps me alive! en kaNNA – one who gave himself to me (as krishNa, which is ultimate state of magnanimity). Up till this, the reasons for AzhwAr‘s doubt are listed. ninnalAl ilEn kAN – I cannot even sustain for a fraction of a moment in your separation; it can also be explained as “no one other than you can protect me”. This entry was posted in thiruvAimozhi, thiruvAimozhi 2nd centum on February 26, 2016 by Sarathy Thothathri.